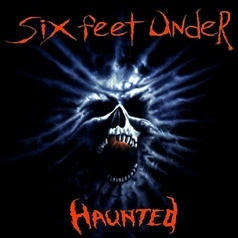 Six Feet Under is a horrible pseudo-Death Metal band that was originally conceived as a side project of members of Cannibal Corpse and Obituary. They even recruited a former member of Death and Massacre. When the idea first came about, supposedly in 1993, this might not have been such a horrible idea, though the sub-genre was either dead or dying by this point already. It took them about two years to finally release their joke of a debut album, Haunted. I remember getting this pile of filth when it came out. Metal Blade promoted the hell out of it, as if it was something special. That was not to be the case. Everything about this is dumbed-down and designed for simple-minded sheep. Chris Barnes seemed to have run out of steam after The Bleeding, as his lyrics were becoming rather redundant by this point. There were a few mildly interesting ideas, but most of this is just really tame and generic. The vocals are also quite dull when compared to the previous year's Cannibal Corpse release. His performance sounds very uninspired and phoned-in for much of the time. Then again, when one examines the boring and often tedious songwriting that he had to work with, it may also be the fault of Allen West. Musically, this has to be one of the most stale albums to ever be vomited forth at the feet of unsuspecting listeners. I absolutely despise "groove Metal", and this record is full of it. Haunted features nearly 40 minutes of mid-paced trash that would have been better off in the rubbish bin. Even worse, the album includes a few stolen ideas from West's primary band, Obituary, and not even good ones at that. He lifted some riffs directly from the equally terrible World Demise L.P. Not only are the riffs mundane, but the song structures, combined with the formulaic lyrics and vocals, make this entire endeavour all the more tiring. While Haunted may be the 'best' thing that Six Feet Under ever released, that is not saying much. Seriously. This simplistic garbage is a mere parody of Death Metal. There is not one shred of darkness or any hint of morbid atmosphere to be found within any of these eleven(!) songs. Something like this may serve as a gateway band for kids that haven't graduated beyond the likes Pantera, but true Death Metal this absolutely is not. Avoid this farce, by all means.